The new art work coming out of Herbich International's art foundry, designed and finished by Franz Herbich can now be seen in Tabuelan at Cebu Island. 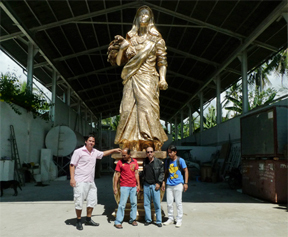 The first bronze sculpture of San Pedro de Cebu is now available. Since the unveiling at the City Hall of the City Iloilo – Philippines, August 25 2011, the citizens of Iloilo are proud to have their new Icon. 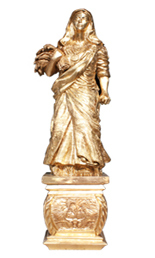 The bronze statue weighs 1.7 t and measures 5 meters in height. Based on the idea of ED Defensor, a well-known Philippine Artist casted by Herbich International Arts and Manufacturing Corporation. “What you will see is a Lin-ay wearing the traditional bandana usually worn by farm girls to protect them from the heat of the sun. On her neck she wears an ethnic necklace, symbolic of her ancestry, as she comes from a rich mythic past, from the Maragtas, the “Barter of Panay”, and the long line of heroic datus that peopled the island of Panay. Her right arm cradles a bunch of harvested rice, symbolic of our prosperity. Her left hand holds another symbol of prosperity, the scythe or “garab” which has long been the traditional harvesting implement of Western Visayas. I remember when I was a child in the farms of Mina, Iloilo, whenever I saw a “garab”, I knew right away it was “good times” for it was harvest time. She wears an embroidered blouse, symbolic again of one of the popular traditional arts of this city and province. On top of it is a “sablay” of “hablon”, the textile which contributed to Iloilo’s becoming the second city of the Philippines, second only to Manila, at the onset of the 19th century. The whole figure of the Lin-ay is highlighted by the “patadyong”, our native hand-woven wrap-around skirt, for which no other province is better known than Iloilo. As a bona fide art historian I dare say that Iloilo has the best patadyong in the whole country. We uploaded the new Album of Pictures taken at the Workshop on Nov. 19 2010. We now offer a workshop on "How to make a sculpture". The Gallery of Napoleon Veloso Abueva, National Artist, was updated. We are proud that we launched our new web site. You can order now your 3D Advertisement or just have a look which new sculptures we are offering. Visit 3D-Advertisement. 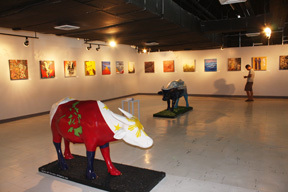 The art work of Franz Herbich is displayed in the Art Center of SM in Cebu. The exhibition "Subay" is opened for the public until September 11 2010 during the business hours of the mall. The Artist Franz Herbich is now introduced. His new art work and the new 3D Advertisementsculptures are presented. 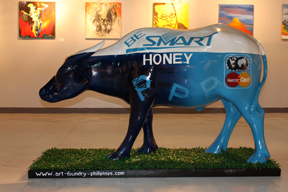 The Tamaraw Project is the begin of a new series of sculptures. Some more sculptures will follow soon. Out of solidarity for the new home country, Franz Herbich created his own version of a bust of Jose Rizal, the most portrayed person in the history of the Philippines. The sculpture was made based on an old oil painting. You can read more about Jose Rizal and his importance to the Philippines inWikipedia.